The refurbished old aerial tram, which used to connect the the towns of Boston Bar and North Bend, sits prominently in Frances Harrington Park on Hwy 1. Storyboards that detail the history of the tram, North Bend, and Boston Bar are found around the perimeter of the park and were created by volunteers from photos and recollection of many of our towns' elders. Pictures painted on the back of the story boards were done by Rick Campbell. Please stop and enjoy your lunch on the picnic tables that are provided in this lovely little spot, and learn something! Memorial Park serves as the town's fairground, and hosts the yearly May Days celebration and often the Canada Day festivities, as well as occasional concerts and weddings. Memorial Park is bordered by the "Memorial Trees," each which stands in remembrance of a member of our community who has passed. In 2014, the open-air concession building at Memorial Park was rebuilt. It has a permanent roof and a stage facility with lights and power. 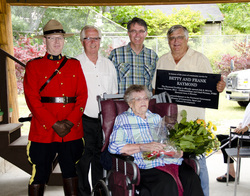 A dedication ceremony was held July 7th 2014 naming it the Raymond Pavilion, in honour of a family that has greatly contributed to this community over many generations. Tuckkwiowhum Village boasts breathtaking views and surroundings, offering our guests an opportunity to experience the Nlaka'pamux village lifestyle before the arrival of European culture. We offer Guided Tours as well as Self Guided Tours, a full service Longhouse/Events Pavilion and an onsite Restaurant for catered events and groups. When you are finished with your tour, come visit the Museum and Gift Shop to find beautiful and authentic native art and clothing! The original cross was crafted and designed by Bryan Kerr, out of a single 42 foot single wooden log and has stood on this spot since May 1992. The Pfenniger family prepared the mountain plateau and road up to the cross. The cross was engineered by Dan Lillos, Chris Achliman doing the ground work and cement. Larry Hands installed the light system in 2002. The Alpine Cross is sponsored by the Fred Pfenniger family. After 13 years in the weather and visits from a local resident wood pecker by the name of Harry, the cross was starting to decay. It was decided to replace the wooden cross with a heavy duty aluminum one instead. The new cross designed along the same lines as the old wooden one and stands 40 feet high. It was constructed by IMW Industries in Chilliwack and brought to the site. The cross is mounted using all steel construction, which will make it next to maintenance free. To ensure that everything relating to the new placement went smoothly, a crane was brought in from Abbotsford. The cross is lit every night for six hours by a 1500 foot hand buried electrical cable. Every part of the construction was carried out by a group of dedicated volunteers. The 1.2 km trail to the cross, which is on privately owned land, is approximately 5kl from town. It is located at the end of Pfenniger road which runs parallel to the high way. Visitors can park on Pfenniger road and walk up to the trail head. There is a small gate across, but visitors may just walk through on foot. After a fairly vigorous hike up, visitors can view a gorgeous view of the Fraser River. There is a bench, guest book and an information kiosk with a plaque identifying all the volunteers. The locals know when they see the cross, they are almost home. A card designed by Patricia Davison depicts the cross and relates the story on the back flap. 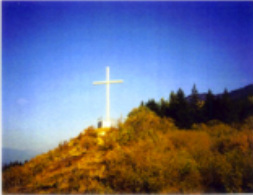 The cards are available in the Canyon Alpine district and the proceeds go towards the cost of lighting the cross. 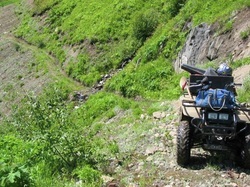 The Mountains and Rivers that surround the towns of Boston Bar and North Bend provide a fantastic environment for all those that enjoy the outdoors. North Bend as well as other places in B.C. 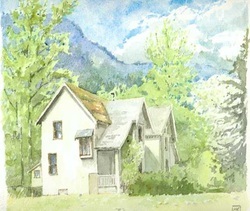 In addition to his art, his web-site features beautiful old photos and commentary from many people that lived in North Bend during its heyday as a bustling railway town.